The Prince William Board of County Supervisors approved the following projects described in the Foundation’s work plan for featured fundraising. The Foundation Board encourages citizens, corporations and businesses to donate funds to support these projects to ensure that Prince William County’s precious historic sites remain first-class heritage tourism destinations. All County-owned historic sites may be financially supported by designated donations to a specific site or project. 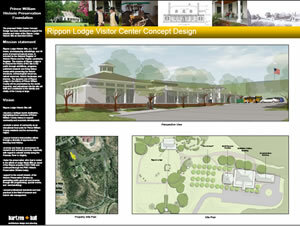 The Visitor Center will house exhibitions that explore the histories of Rippon Lodge and the communities that developed along the colonial Potomac River. The Visitor Center will include visitor service amenities such as a small theater, a museum shop and restrooms as well as space for collections storage and staff offices. The completed building will feature an attractive multipurpose room that will accommodate educational programs and rentals. Commonwealth Architects has completed their engineering study and report on the stability of the 1822 Jail. The Foundation Board and county staff now understand the magnitude of the building’s deterioration and are making a plan for its stabilization. The tentative long-range plan is to restore the Jail to its 1820s appearance. Restored spaces will include jail cells, jailor living quarters and museum exhibition space. The Foundation and County staff are preparing Bristoe Station Battlefield Heritage Park for Virginia’s statewide Sesquicentennial Commemoration of the American Civil War. Funds are being raised to preserve and protect the Park’s Confederate cemeteries, to develop walking trails and to improve Park infrastructure to serve more visitors. Plans include installing interpretive signs and fencing, removing excessive and invasive vegetation and restoring wildlife habitats. ©Prince William Historic Preservation Foundation, all rights reserved.